Love curry and coconut, but this was too sweet and to much tomato sauce for me. I have made this several times now and I do different combinations each time depending on what I need to use up. I love adding green peppers and a couple small diced potatoes. I also use coconut oil instead of vegetable, add a tad of turmeric, and red pepper flakes. This recipe is an excellent recipe to do make full diverse meals in less than an hour. My husband smells it walking in the door and grins knowing one of his favorite dinners is coming. Thanks for an excellent post!! This was delicious tonight, I was concerned about it being too saucy at the start but leaving it for 40 mins definitely fixes that! I’m used to making hubby spicy dishes and modifying them to be mild for my daughter and I so when this was sweet it was totally brand new. It was really divine, we all loved it. There are only three of us so it makes a bit much, but next time I might put some rice in to soak up some of those delicious juices and serve with a naan. I have made this recipe for my family 5 or 6 times now and they just love it! I just wanted to send a quick Thank you. I felt it was a little too sweet. Probably my own fault…I may have put too much sugar on accident. But adding a little chicken bouillon helped. What is the garnish? Cilantro? Parsley? I used parsley to garnish this dish. can you make this in a crock pot and let it sit for almost all day? I have not tried this recipe on a crockpot. This looks amazing! Do you think I could do this in the crock pot?? I have not tried making this recipe on crockpot so I don’t know what the outcome of the dish would be. Is tomatoe sauce the same as spaghetti sauce ? The spaghetti sauce and tomato sauce are both made out of tomatoes. Spaghetti has spices in it and therefore when used in this recipe might change the flavor of the dish. You may use passata if you don’t have access to tomato sauce. Hope this helps! What a great recipe! We add 2 thai chilies to add a touch of heat with the onion and garlic. I also add basil cut into strips right before serving. Also serve it over jasmine rice. Such a hit in my house! Yummy! I made 2 versions of this tonight: one with turkey thigh for me and the kids, the second with shrimp for the husband. I didn’t have the tomato sauce so put in extra diced tomatoes. Both versions were very delicious (even if not authentic)! Thumbs up from the whole family. We served the meat over quinoa and peas. Salamat! This recipe.looks wonderful. Can I use boneless skinless chicken thigh instead of breast? Also, if I were to add cashews, when would be the best time to add them? Hi Liz, You can definitely use boneless skinless chicken thighs instead of chicken breast. I would add the cashews at the same time as the coconut milk and tomatoes. I hope this helps! Tried this recipe and it turned out amazing. Kids loved it and I added couple chillies to give it a bit of a kick. Can’t wsit to make it again when I entertain some friends. Thank you so much. This recipe was fantastic! I used coconut oil instead of vegetable oil but otherwise made it as suggested. I also threw in 1 cup of frozen peas and 1 cup of paneer, and served the curry with naan bread to soak up all the delicious sauce. My whole family devoured this dish, and I’ll definitely be making this one again. Thanks! Can you use Silk boxed coconut milk instead of canned? Yes, you can use silk boxed coconut milk. Thanks for sharing this. I had never made a curry dish before this, so it was a fun new undertaking. I found that the flavor was mild, so I added salt, curry, turmeric and a little red pepper. Just added to taste for a little more pronounced flavor. Thank you soooo much for this recipe! I have made it several times, it’s my family’s favorite and I never seem to make enough for them. The only thing I do different is add 3 sliced jalapenos for heat. I serve with steamed basmati rice, yogurt, cilantro and Baan bread. Thanks for writing and I am glad it turned out great! I did this recipe and i was confused about the big amount of tomato sauce because i felt that it would cover all the taste. But I stayed loyal to the recipe and made it like it was written to see the result. It was amazing, the taste is exceptional! ! Ps: sorry but can u tell me the original country of this recipe. This is very similar to Kashmiri Curry – which takes a long time to make; this is kinda a shortcut. But it’s also similar to some Thai curries that I’ve had. Peace. This was easy and delicious! I only had 1 lb of chicken, so at the last few minutes I added a bag of frozen veg (large pieces of broccoli, cauliflower, and carrots), and it was wonderful. I left out the sugar, and I thought it was perfect. Has anyone tried this with yellow or red Thai curry paste? I have the powder as well but was curious if the flavors work well th that instead? 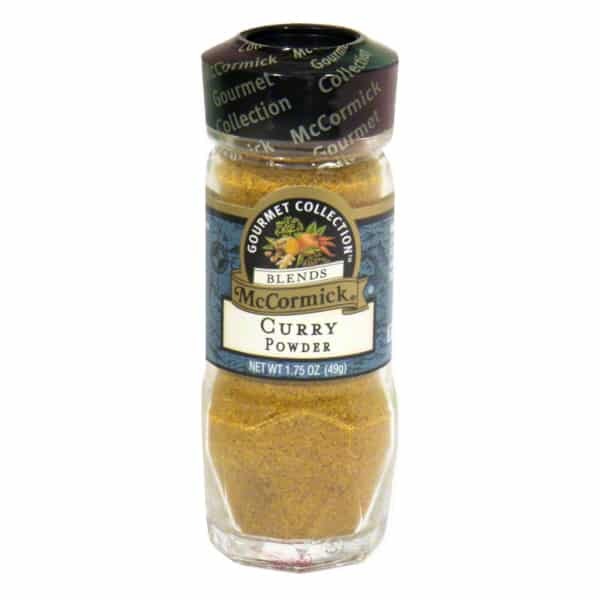 I use curry powder then add a tablespoon or so of red curry paste. I don’t put the sugar in it. Wow! This is easily one of my favorite recipes ever! It was the first time I made a curry too! I did add about two teaspoons of chicken stock (Better Than Bullion) and some pink Himalayan sea salt and pepper. I also like spicy food, so I added Cayenne pepper. Thank you, Liza! This recipe alone makes me a loyal fan. Thanks for posting this excellent recipe. I didn’t change it, apart from converting the measures to metric (I’m in Australia). I’m going to make it again soon! I am normally not a fan of curry because they are too creamy or too saucy; however, my husband loves curry. I ran across this recipe to give it a whirl. The first time i made this, I followed it as closely as I could but in the middle I discovered I had run out of tomato sauce. It wa perfect! Even I loved it! I’m making it again tonight adding yellow pepper and potato to clear out some old veg, I can’t wait for dinner tonight! I’ve made this dish twice now. The first time was awesome! I accidentally used a 14oz can of tomato sauce too. Second time was way too watery and sweet. I’ll have to keep making it and find out a ratio that I like. Overall great recipe! Hi Jay! The whole dish is 6 servings. The nutritional information is per 1 serving. So, about 1/6 of the whole dish is considered a single serving. I hope that helps! Ran across this recipe accidentally so am going to give it a whirl. Think I will add caulifower and potato with golden raisins to the chicken mix! Hmmm. Salivating already. Wonder if there are any sliced almonds lolling in my cupboard. Your plan sounds great Pamela! Hi, thanks for this recipe, it sounds amazing! I’m just a bit confused about the tomatoe sauce. I’m in UK so would this mean tomato ketchup? Hi Louise! You can use passata instead of tomato sauce. I hope that helps! This dish is such a huge hit in my house. I found it on a whim and ever since making it, everyone has loved it. They even requested it for tonight’s dish. Only difference that we are gonna try tonight is that we are gonna add some type of nut. It’s similar to an Iranian dish I make that has walnuts in it and they all love it. My stepdaughter who hates Curry dishes,even loves this dish. Can’t wait for dinner tonight! This sounds delicious…..can you tell me what kind of rice I should use to make this dish authentic? Thanks for this recipe. Jasmine rice is perfect for this dish. Enjoy! Thanks for sharing your delicious recipe. I skimmed the recipe then ran to the kitchen and made it lickety-split and it turned out delicious. Of course, I had to adapt it to the ingredients I had on hand, e.g. only one chicken breast and a can of garbanzo beans, drained. Also, instead of cooking oil, I used coconut oil with a teensy bit of rendered chicken fat from the breast. Instead of seasoning the chicken w/ S&P, I used cayenne pepper and a sprinkling of Kn… chicken soup powder from the Hispanic section of the local grocery store. Oh yes, I forgot about the sugar because I was working on warming my leftover rice AND loading the dishwasher. By the time I was finished so was the curry and it was simply scrumptious. So adaptable, quick, easy and ever so tasty. Hello again, Liza. My two grown kiddos visited yesterday and I tried it out on them and they really enjoyed it. I served it over millet instead of rice for a change of pace. Just as lip-smacking good warmed up as when I first made it. I think it would be awesome to make a double-batch of Coconut Curry Chicken to freeze half so as to have a delicious dinner ready made that only needs to thaw out. Hi Liza, Thanks you for sharing this simple and delicious recipe. Yum.. My partner and I tried to cook it for the first time last week and we end up cooking it again tonight. =) We bring the left over to work. We add potatoes and simmer longer to reduce the liquid. Thanks again. Love it! Has anyone tried this recipient without tomato products? I can’t eat tomatoe or pepper products. Do you think the flavor would be flat without the tomatoes? I was happy with how easy and delicious this was! I usually shy away from curry dishes because they are difficult, but this was a breeze. Thanks for sharing! I decided to add in some carrot, red bell pepper, and butternut squash and my family didn’t even notice. Here’s to sneaking in vegetables! I love butternut squash and I will try using them next time. This is such a versatile and wonderful recipe! It’s delicious as listed above but also gives so much room for customization – all the changes in the comments also sound delicious. Made this for dinner for my girlfriend tonight, thank you for sharing! The equivalent of tomato sauce in the Uk, if I am not mistaken, is passata. I made this last night for the 8 people in our home. I used 3lbs if cubed pork loin because we had no chicken defrosted. Two of us are also keto so I left out the sugar. The only other thing I did differently was added a little more of seasoning and oil because I had more meat. This turned amazing. We all loved it and there was NONE left! Will DEFINITELY be making this again. Can’t wait to try it with chicken! Thanks for such a great recipe! This ias the best curry recip I’ve ever made and so easy. You have to have condiments to add, though I used raisins toasted coconut, toasted cashews, chopped celery and fresh basil. Ould have some green onions but didn’t have any. This will be my curry recipe from now on. No chicken broth…yay!! I used a whole lg can of tomato sauce, too and extra curry. I’m hoping to try this recipe tonight and am wanting to use chicken tenders, how do you think I should change the cook time to adapt? I have not used chicken tenders to make this recipe but you can try by cooking it for 20 minutes and then add more cooking time, if needed. The taste was good but nothing I did would thicken this sauce! I tried simmering for longer and even adding cornstarch. Nothing worked. If I made this again, I definitely would cut down on the luiquidy substances mentioned in the original recipe. Was really good but was too spicy for my husband I think I will use half of the curry next time. I also used brown sugar. Can I mince the garlic or does it need to be crushed? Yes, you can mince the garlic. Going to give this recipe a try! Looks delicious. If indont have vegetable oil can I use canola oil instead? Thanks! Just made it. Super easy, and so, so delicious.I also added coconut block (about half block) as love coconut. I’ll definitely make it again. Also made it with prawns in separate pot – perfect! Made this for dinner tonight and we LOVE it! I’ll definitely be making this again. Thanks for the great recipe!